A walking trip in the Ochils near to Stirling was a great excuse for a bit of a treat. Nearby Blairmains Farm Shop was the ideal location. We headed into the cafe which had the wonderfully Scottish name 'Coffee Bothy' an advertised a Sweet Pie of the Day. 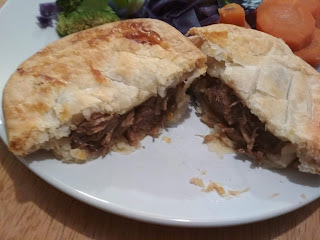 The farm shop also had a good range of meat pies so how could I resist? I grabbed an Apple pie and a Steak & Ale Pie, both timeless classics. I started with pudding by eating the sweet apple pie first. At £1.95 it wasn't very expensive but then it wasn't very big. It looked well cooked with brown pastry librally coated in sugar. I thought it looked great, with an interesting shape to the pastry case. It stood up on its own without the need for a foil case which indicated sturdy pastry. However, it wasn't very tall so unfortunately there wasn't a lot of room for much apple filling. 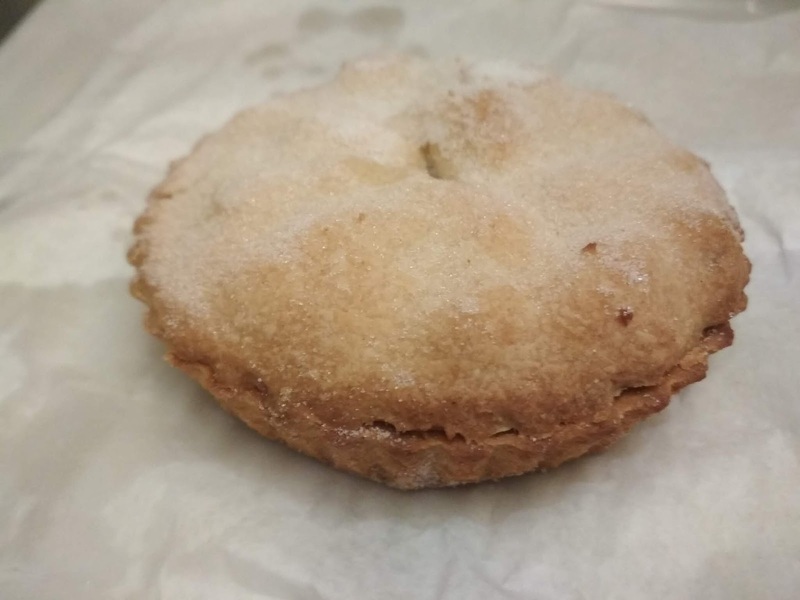 The pastry was different to many apple pies in that it tasted more like the shortbread that you might get with a christmas mince pie. I enjoyed the crunchy biscuit taste for a nice change. It was quite sweet and I am not sure I could have eaten more of it because it was a bit sickly. Despite not being very big it was well filled. The small size didn't allow for big chunks of apple. The filling was nice but was a long way off being my favourite apple pie filling. It was a bit more like the apple jam that you get in Mr Kipling apple pies. 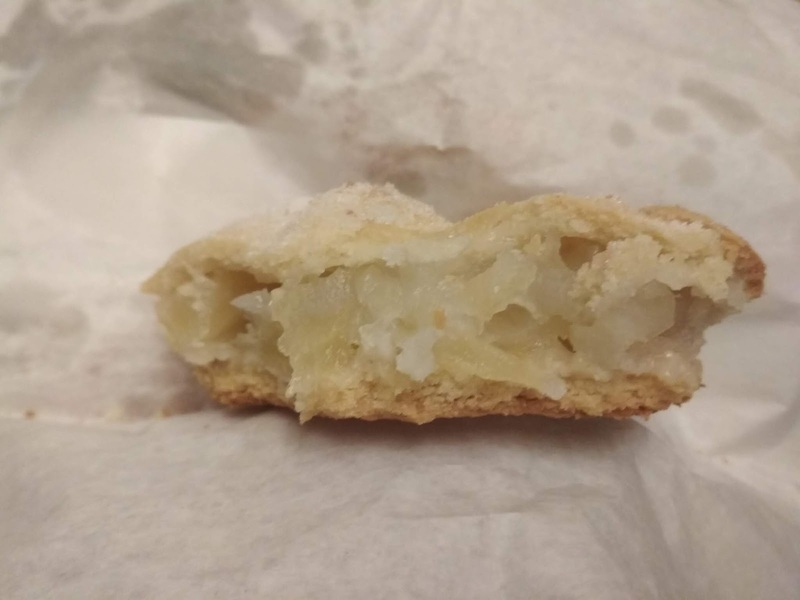 There were distinct chunks of apple but they were soft so the pie relied on the pastry to provide a bit of texture. Despite some shortfalls, this pie did really hit the spot, giving me a sugar boost after a lot of walking. It was a nice change to other apple pies. I took the Steak & Ale pie home with me to eat later. At £2.95 this pie promised locally reared meat. The pie was in the classic oval shape where the pastry lid is much wider than the base meaning there is less Capacity than you might expect. This tactic is normally used by pies at the lower end of the market so it wasn't all that promising. At £2.95 I expected what little filling they could fit in there to be top quality. And I wasn't disappointed by the quality, the meat was very nice and tasty. However, there was a bit of a lack of sauce in the pie and when the pastry to filling ratio was a bit pastry heavy I could have used some gravy to help the pastry go down. The pastry was a bit generic and lacking in the golden brown Colour you expect for a high end pie. 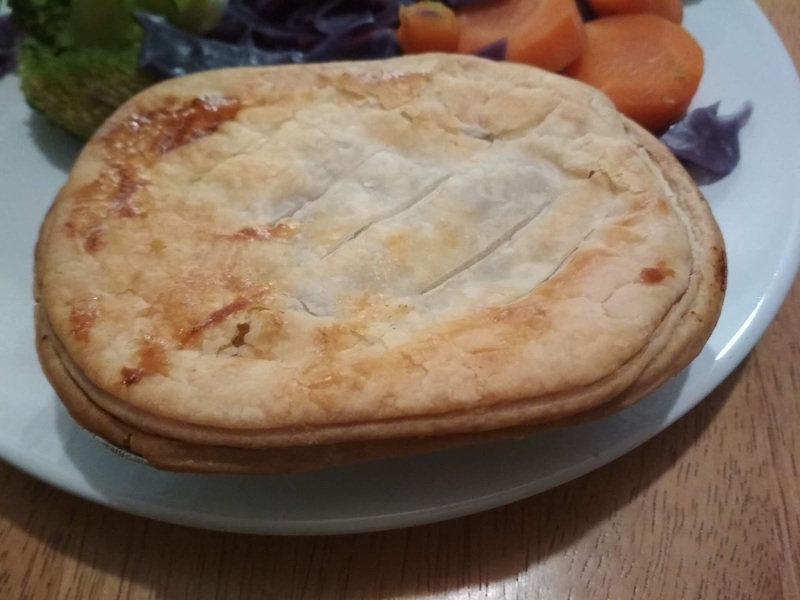 Whilst it travelled back down to England in an excellent Condition, the style of pie also looked a bit generic and again, not quite what I expect for the price. Whilst reasonably tasty I could have probably have eaten two of these pies. A million thank yous to pie fans of the World!